It was a match made in heaven when I first set eyes on the beautiful, glossy-black, portable, 1935 Royal typewriter. It was quietly sitting on the store shelf, just waiting for someone to come along and take it home. I looked admiringly at the shiny glass and chrome keys, and ran a finger along the shiny black finish. I ended up leaving the typewriter sitting on the store shelf that day, but for the next two weeks, the little typewriter continued to pop up in my thoughts. After talking it over with my husband Joey, I decided that I would get the little typewriter as an early birthday present. I was very excited to go back to the store and see if the typewriter was still there. The day finally arrived when we would make the trip into town and I could visit the store. After walking in, I went right over to the shelf where the typewriter had been displayed. Oh no! My heart sank. It was gone. I continued to look around in the hopes that it had been moved to a new display. Finally, in the back of the store, I spotted it! It was sitting in it’s case on a short shelf. I was thrilled to see it again! Joey purchased the typewriter and we were on our way home. 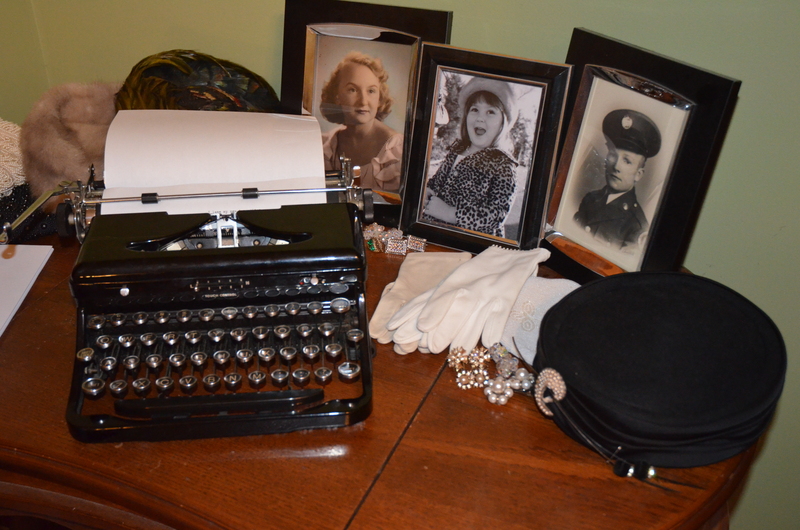 Once home, I immediately took the typewriter out of it’s case and set it up on the dining room table. It was just wonderful! The finish on the body and keys looked pristine. As I typed, the keys made that wonderful clickety-clack sound that is completely missing in today’s computer keyboards. My little girl was very interested in the typewriter and said, “Turn it on!”. I explained to her that it was “on”. Her look of surprise quickly turned to delight as I showed her how the typewriter worked. She sat typing happily away and exclaimed that she was, “never typing on a computer again!”. I knew exactly how she felt! Of course, I will keep typing on the computer. It’s really inevitable if I want to continue writing for my blog, using the Internet, or doing the million and one things that we use computers for today. But, it will never be the same as my lovely little Royal typewriter. There’s nothing as satisfying as hearing the clack of the keys and listening to the “ding” when you reach the end of a line. Not only has the little typewriter stolen my heart, it’s also stolen my imagination. As I type along, I can’t help but wonder what other fingers have typed on those keys. What sorts of letters and documents has this machine produced? Maybe letters to old friends? Recipes for a country kitchen? Possibly even office papers for a secretary or businessman? It’s been many years since 1935. Our country has been through many changes in that time, and this little typewriter has been around for all of them. As well as the past, my thoughts also run ahead to the future. This sturdy machine was made to last. I am sure that it will still be capable of functioning long after I am gone. I am just one in a line of owners that this machine has had. Who will own it after me? My daughter? Perhaps a future grandchild? Time will only tell what the future holds. For now, I will just enjoy the fun of typing and creating stories on a lovely, glossy-black, shiny chrome, cllickety-clack, portable, 1935 Royal typewriter. Every Saturday in the spring, summer, and fall, we roll into the local farmer’s market, set up our gear, and sell veggies from 7:00 to 1:00. I love the farmer’s market! It’s really one of the high points in our week. It’s the point where all of our hard work pays off as we sell our vegetables, visit with friends, and share gardening tips and recipes. For the most part, it’s a true delight! 99.9% of our customers are amazing “salt of the earth” kind of folks. But…there’s always that .01% of people that are just, well…rude. Yes, rude! I’m just throwing it out there and calling it what it is. I generally try to be a likable person and get along with everyone, but these people simply astound me. But, I don’t. I bite my tongue and smile and try to explain to them how our produce is much different than the produce that the large chain stores carry. It further irks me if people walk away when I am explaining this to them. My husband Joey, who is pretty laid back, just takes it with a grain of salt and says to “forget it”. I, who tend to be obsessive and high strung, have a hard time doing that. Somehow, I want to fix it. I want to make them understand how much of our heart and soul goes into what we do. I want to make them see that for us, it’s not just selling some vegetables to make few bucks. It’s our whole way of life. From planting, to saving money for buying seeds and supplies, to teaching others about being self sufficient, to sharing our family heritage of farming, the farm is a major part of who we are and what we do. It makes me sad that everyone doesn’t appreciate fresh vegetables that are grown and nurtured with everything we’ve got. We give 110% to the farm and our produce. It’s disappointing that some people can’t even make a simple effort to be polite. I guess that’s just the way the world turns. Happily, for every sourpuss that I talk to, there are about 15 brilliant sunbeams with good manners and nice comments. We love providing good food for good folks. Those shining sunbeam people make all our hard work worthwhile. *How about you? Do you ever have to deal with people that are rude? Do you, “just forget it” like Joey, or do you obsess like me? Are you a sourpuss or a sunbeam? 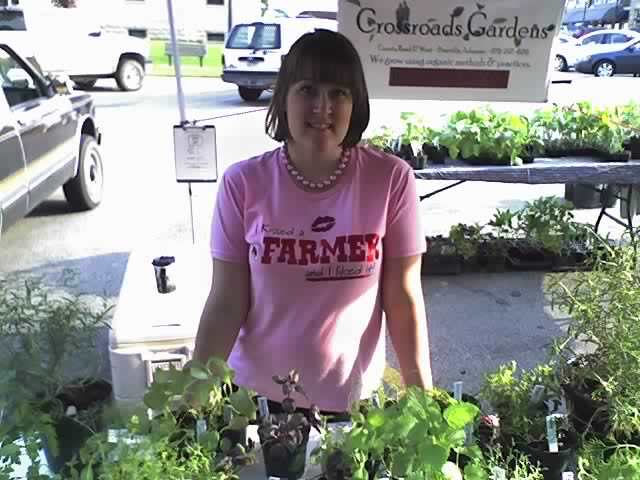 Here I am selling vegetables and herbs at our farmer’s market booth! “I might as well tell you how to do this son. It doesn’t seem like anybody’s much interested anymore. I won’t live forever and it’d be nice to let someone else know how to do it.”, said the old man. Joey’s face lit up and he said, “I’d really appreciate it sir. I’d be glad to know how.” That day, the old man (who raised blueberries) took us around his farm and showed us the basics of how to propagate blueberries. Along the way, we heard stories about his life on the farm, we saw the farm through his eyes as it used to be, and we made memories that we’ll never forget. It was a day to treasure. Joey and I have both been blessed to come from families that enjoy keeping the old ways of doing things alive. We love and appreciate learning about the way things were. Growing up, our families did things like building their own homes, making lye soap (in a giant cast iron kettle in the front yard), sewing their own clothes, canning, drying, and preserving food, making food from scratch, milking cows and making homemade dairy products, building furniture, handcrafting musical instruments, weaving, and more. We were kind of the “Fox Fire” kids! That’s not to say that our families didn’t have modern conveniences. They certainly did. They just kept on doing the things that they had learned from their grandparents and great grandparents while enjoying modern things like refrigeration and indoor plumbing. It’s funny that when we grew up, neither one of us wanted to keep doing things the old way. “It’s to hard. Everything can be bought cheaply at the store.”, we said. Boy, were we wrong! Most of you know that once we had our little girl, things took a drastic change. We began to see why our parents valued the old ways of life so much and we began putting the old ways back into practice. As we began this journey, we started to meet some incredible folks, like the blueberry man I mentioned above. It has been such a blessing to know and hear the stories that these people have to tell. 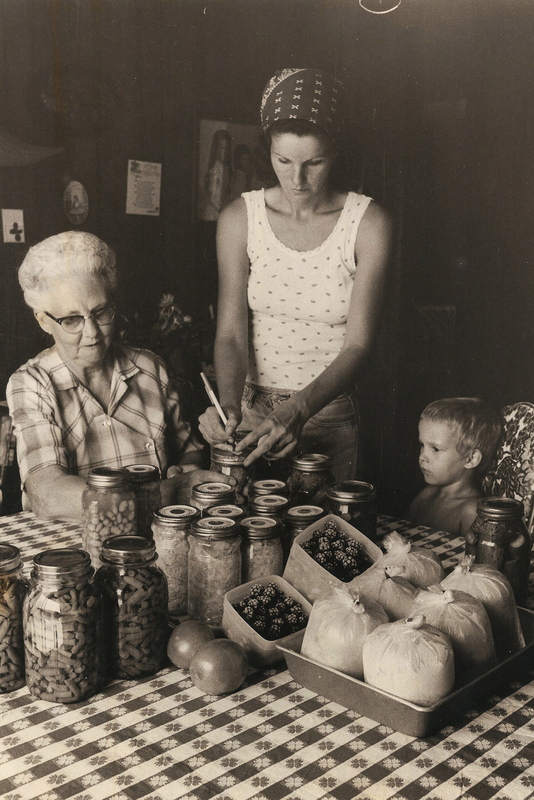 We’ve heard blue ribbon canning tips from little old ladies, listened to stories of back breaking work from old men, and have seen the sparkle in the eyes of farm couples as they tell us about what it was like to raise their families on the farm. Every time we meet these people, it seems like such a gift! We feel so privileged to hear their stories and learn from them. There is so much wisdom and knowledge about the old ways of life that needs to be passed on to a younger generation. These folks are eager and waiting for someone to tell! We love to learn and listen, and we also really enjoy getting to teach and encourage others about how to do things for yourself. It’s not unusual for us to be giving an impromptu lesson at our Farmer’s Market stand on Saturday morning about drying herbs or canning tomatoes. Joey and I were blessed to grow up in families where we learned these things at the elbow of a trusted adult, but we know that a lot of people didn’t have that blessing. We try to let people know that doing things in an old fashioned way doesn’t have to be mind boggling. Most of the time, it’s pretty simple. You usually don’t have to have a lot of expensive or fancy equipment. You just have to have a little time and a little patience. Doing things for yourself is so rewarding. When you look at a cabinet filled with jars of food that you’ve preserved, drink a glass of milk from your own cow, or wear an outfit that you’ve made yourself, it just makes you feel good! If the thought of doing things yourself is overwhelming, just start small. Instead of buying a box mix of brownies at the store this week, pull out a cookbook (or use the computer to look up a recipe) and make a batch of homemade brownies. You’ll be surprised at how easy it is and at how good they taste. Your family will “oooh and ahhh” that you made them from scratch. Add things a little at a time. If the idea of growing all your own food is intimidating, try growing just a few tomato plants or maybe a cucumber vine. Is the idea of sewing a dress laughable? How about starting with a small project like placemats or an apron? Whatever you choose, give it your best effort. Be proud of your work and don’t expect everything to be perfect. Enjoy the rewards of something made by your own hands and get ready for a journey that you will treasure for a life time!